1. 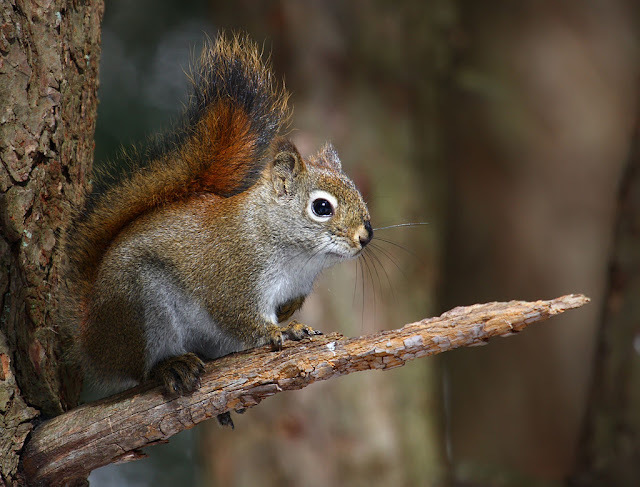 Despite their name, red squirrels can have coats ranging from almost black to chestnut or light brown on the back. The chest and stomach are white. They are famed for their characteristically long eartufts, which are especially prominent in winter. 2. The Latin name is Sciurus Vulgaris. 3. The American red squirrel is referred to, as the chickaree,pine,chatterbox,boomer squirrel. 4. Red squirrels are known for being loud and raucous. 5. They eat primarily conifer seeds in the winter, but during the spring and summer they add flowers, berries, eggs, nestling birds and insects to their diet. 6. They have four fingers on each hand and five toes on each foot and are very athletic and can hang upside down! 7. Red Squirrels can locate their buried food supplies in over 1 foot of snow! 8. It is thought that the Red Squirrel made their way to the British Isles from mainland Europe at the end of the last Ice Age, approximately 10,000 years ago! 9. Red Squirrels shed their coats twice a year, switching between a thinner coat in summer and a darker, thicker winter coat. 10. Males may live in an area of up to 17 hectares of woodland.. that’s about the same size as 34 football pitches! 11. Red squirrels do not hibernate, hence they cache foods underground for these tougher months. 12. Red and Grey Squirrels cannot breed together. 13. Grey Squirrels transmit the deadly squirrel pox virus to the Reds. Greys are immune and are only carriers. 14. Young squirrels are called kittens or kits. They are blind for the first 3 to 4 weeks of life and are born without hair and teeth! 15. Female squirrels usually have one litter each year, with three young squirrels in an average family. 16. Only 1 in 6 Red Squirrels sees its first birthday due to premature death after birth, disease, starvation in winter or through being eaten by large carnivores or birds of prey. 17. Red squirrels have deep reddish brown fur, large tufty ears which are more noticeable in winter, and big bushy tails, which can bleach in the spring. 18. Adults grow up to 24cm long and weigh about 350g. A squirrel’s tail is almost as long as its body-about 17.5cm. 19. The body length of a fully grown male is 20-22cm and its tail length is 17-18cm. 20. The life span of a Red Squirrel is on average 3 years although in captivity they have been known to live for up to 10 years! 21. A squirrel’s nest is called a drey. Red squirrels build their dreys in forks or hollows of trees. The dreys, which are made of twigs and leaves, are lined with soft hair and moss. 22. Red Squirrels are good swimmers! 23. Red Squirrels often build more than one drey per year, they move out when fleas become intolerable! 24. Red squirrels are clever little animals which Scan tell good nuts from rotten nuts. They can tell which nuts to open by weighing them in their paws. 25. Squirrels that are fed by humans can lose their fear of people and become aggressive when they don’t get food as expected. 26. As members of the rodent family, they have large incisor teeth, kept sharp by constant gnawing. 27. Red squirrels are clever little animals which can tell good nuts from rotten nuts. They can tell which nuts to open by weighing them in their paws. 28. In medieval times, squirrel fur or ‘vair’ gave soft and sumptuous cloak linings and hood trimmings for those who could afford it. 29. Beatrix Potter wrote ‘The tale of Squirrel Nutkin’, arguably the world’s most well-known story about a red squirrel, when she lived in the Lake District. 31. Grey squirrels carry squirrel pox virus, which does not harm the greys but is fatal if contracted by reds, as there is no cure. 32. 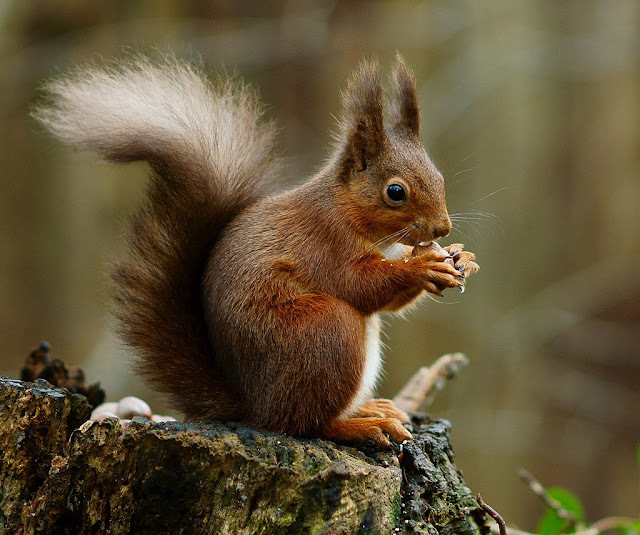 Red squirrels are left or right handed when eating pine cones. 33. Squirrels moult their coat twice a year, once after winter to provide a thin coat for summer, and then in the late summer to provide a thicker and warmer coat before the colder winter weather sets in. 34. They lose their distinctive ear tufts once a year, when they moult in late autumn.